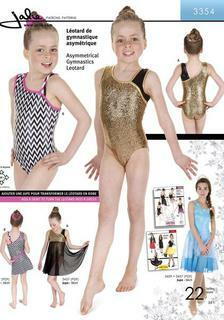 This Simplicity Dance pattern features knit bodysuit with shorts that can be worn under one shoulder dress or open skirt, lyrical halter bodysuit with attached skirt, cropped top with high neckline, and asymmetric skirt. 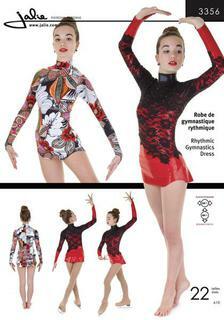 Make this dance outfit for competitions, classes, or pair with other pieces in your wardrobe. 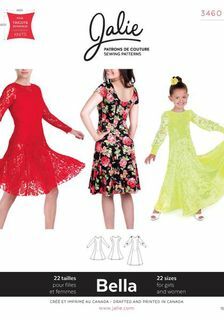 Pattern includes leotard, crop top, halter bra, hi-low & a handkerchief skirt, hi-lo waist shorts, shrug & shrug with overlay.Fabrics: Sized for stretch knit s only: Activewear Knits, Two Way Stretch. See Pick-A-Knit® Rule. Suitable for Overlock /Serger. A,C,F,G Lining in Tricot.I Shrug in Tulle. SIZING: Please note this pattern sizing is for women not girls. Misses' belly dancer top, skirt and belt costume sewing pattern. 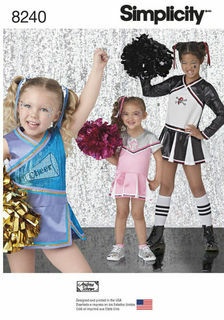 Cheerleading costumes sized for children 3 to 6 and girls 7-14 are great for Halloween or dress-up play. Use metallic fabrics for extra pizzazz. Knit bloomers included. Misses' Knit Bodysuits The bodysuit is the perfect piece to add to any wardrobe! Make these trendy knit bodysuits for Misses in five styles loaded with options! Bodysuits can be made with a mock neck, crew neckline, or a deep V-neck. Mock neck bodysuit has the option of being long sleeve or short sleeve with cold shoulders. Crew neckline bodysuit can be made with long bell sleeves. Deep V-neck bodysuit can be made with a wrap front or with a lace-up front. 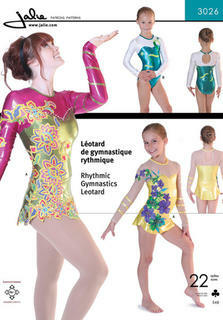 Gymnastics Leotard pattern A: Asymmetrical leotard with wide contrast strap and contrast binding. 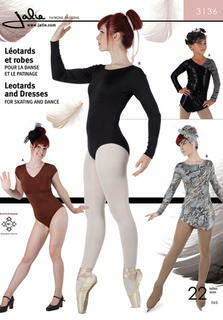 B: Asymmetrical leotard with contrast binding and three spaghetti straps you can criss-cross or braid. 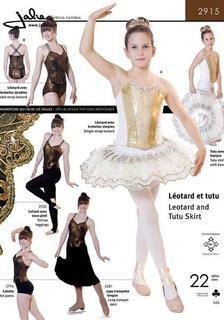 Add a skirt to the leotard to turn it into a dance or skating dress. Fitted dress with back zip, high neck, long pointed sleeve with finger loop, shaped help for longer leg and attached briefs. Made it in a stretch fleece (one size up) without the briefs, this makes a great skirted jacket over fun 3027 tights and keeps the little ones warm on the ice. Skating dress with seamless sleeve (long with finger loop or three-quarter), keyhole back, sweetheart seam, A-line skirt with leg-lengthening hemline. This pattern is compatible at the waist with our Anne Cheerleading Uniform for a bodysuit with skort or shorts. Anne Cheerleading Uniform One-piece bodysuit with banded V neck, shorts and optional skirt pattern in the front (skort). Contrast appliqués at the bodice and sleeve are optional. This pattern is compatible at the waist with the Carmen Skating Dress (sold separately) for a bodysuit with sweetheart bodice and seamless sleeve.